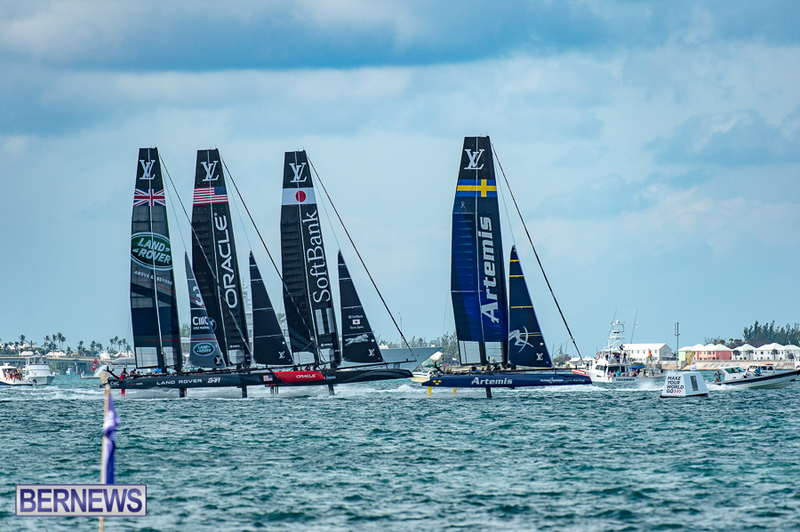 From October 16-18, 2015 Bermuda hosted the Louis Vuitton America’s Cup World Series. The ACBDA last week released a report on the economic impact of the event for Bermuda. Below are five important highlights from that report. When Bermuda initially evaluated the benefits to hosting the 35th America’s Cup a few key areas were identified: Tourism promotion and revenue; economic stimulus through foreign currency spending and investment and; a wide range of opportunities for Bermudians. The economic impact report for last October’s Louis Vuitton America’s Cup World Series event provided tangible evidence that these goals are being realised and illustrated how the America’s Cup is working for Bermuda. For Bermudian businesses and entrepreneurs the economic impact of World Series was widespread and meaningful, with an estimated $5.3 million spent amongst the event village vendors, local retailers, local restaurants and the many companies contracted to produce the event, including stage and lighting, video production, security, charter boats and local entertainers. A partnership between the ACEA, ACBDA, BEDC and the Chamber of Commerce helped ensure Bermudian businesses were aware of the opportunities and had access to them. Of the $8.6 million in economic activity generated by the event, seventy percent was spent in foreign currency. Which means visiting AC fans, ACEA production staff, AC commercial partners, international media and members of the competing teams brought about 6 million of new money into the Bermuda economy. The estimated 1500 people who came to Bermuda for the event created $2.6 million in hotel revenue and consumed services for transportation, corporate hospitality, catering and more. The Bermuda World Series event drew a total television audience of 8.1 million viewers from around the world. There were 106 international media representatives from 13 countries that attended the event, producing videos, news articles and social media posts throughout the weekend. The TV coverage was given an equivalent advertising value of $14.1 million, while, as an example of the social media impact, videos of the event produced by the America’s Cup and the competing teams reached 2 million views on Facebook and Youtube. Considering that the World Series events are the preliminary rounds of the competition Bermuda can expect a much larger and more sustained audience for the America’s Cup finals in June 2017. The World Series was one weekend. In the coming year, there will be at least five, probably six, World Series Events around the world. Throughout the coverage of those events, Bermuda will be continually mentioned. In 2017 Bermuda will host five weeks of America’s Cup racing, and more. In addition to the Qualifier Series, Challenger Semi Finals and America’s Cup Finals, the Great Sound will be the venue for the Red Bull Youth America’s Cup, featuring Team BDA, a Superyacht Regatta and a J-Class Regatta. The Marion to Bermuda race also takes place in June 2017, the new Antigua to Bermuda race will entice yachts to our shores and the Tall Ships are scheduled to visit during the 35th America’s Cup. It is safe to say that the World Series was a good warm-up but also a very small one. You are also missing the ongoing benefits of teams here spending money in the local economy, engaging in activities, and time inspiring Bermudians. You are also missing the price of the opportunities granted to the young Bermudians who have sailed with the teams and worked with the teams. You have also missed the catering, in house training and opportunities working for the teams. You have also missed the benefits that Bermuda has attracted more sailing events and the revenue that come in with them. The 8.6m benefit is missing so many things. It is way more than that. Unfortunately there will still be many who just don’t realize the benefits outside of what they see – boats on the water. In addition to the benefits raised by hmmm above, There are many other ways Bermudians are benefitting now and into 2017, and hopefully beyond. For example, on Friday there was a welcoming party put on by Artemis to celebrate moving into their base at Morgan’s Point, built by local construction companies and workers (ask Zane DeSilva). They chartered boats to take guests to and from Hamilton; hired musicians, hired an event organizer; hired caterers and bartenders etc. All local and money flowing into the economy, in March in the slow season. It’s such a shame there is the view it is a rich white man’s sport and of no benefit to all others. Perhaps people who think that need to remember who owns most of the baseball, football and basketball teams, yet that seems to be OK.
blah, blah, blah…. AC….. blah, blah, blah…. OBA…. There… that should cover it….. The weekend was an amazing experience and benefit for all those locals who worked it in whatever way. For those who are negative of the event, imagine if it didn’t happen? So my message to those who are criticising it for whatever reason or see it as only lining the pockets of rich white people….don’t get left behind because all walks of Bermuda life benefitted from it and will continue to do so.